What Business Analyst Skills Do You Need? The web is full of seemingly conflicting advice, the BA standards organizations throw every skill under the sun at you, and the BA training companies self-servingly push you into the courses that they want to sell you – good or bad. In this series of articles, I’m going to guide you through the process of skill-selection so you can determine for yourself what skills you will need based on the situation you’re likely to face. My goal with this series is to have you get a sense of direction by understanding the basics of the BA career and exploring the different options available to you for your career. Peterson & Baker is a consumer products company that has been in business since 1876. They produce everything from soap and shaving foam, to dish washing liquids and laundry detergent. 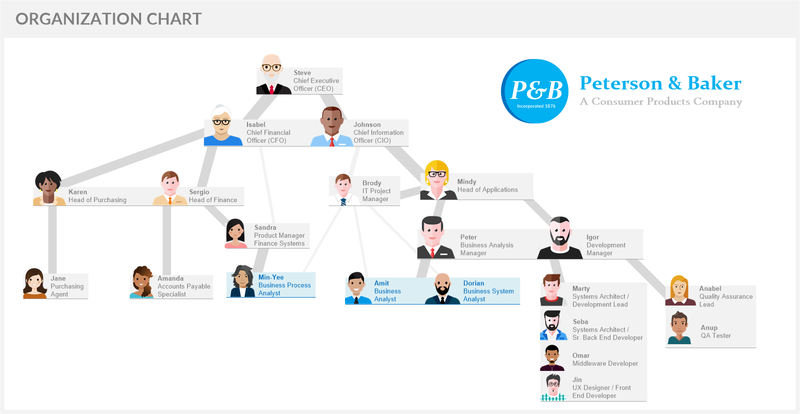 The most important thing for us to know about P&B is that THEY NEED BUSINESS ANALYSTS. I call these the BA Archetypes because they serve as perfect examples of the types of BAs that other companies also tend to hire. Let’s take a close look at each of these three business analysts to see how they got to where they are today, what they do as part of their job, and how they differ from one another. Meet Min-Yee. She hasn’t always been a business analyst. In fact, she used to work as an accounts payable (AP) clerk in the AP department of the Finance division that she now supports through her BA work. Her bachelor’s degree in business had prepared her with the accounting knowledge she needed to do the AP job, but it was her willingness to step out of her comfort zone, and her strong motivation to learn new skills that propelled her into the BA role that she’s doing today. Her domain knowledge in AP came in really handy. She relies on it regularly to make sure that she’s asking the right questions to get to the bottom of issues. Clarifying roles and responsibilities for some department in Finance using a RACI Matrix. Helping the other two BA’s (Dorian and Amit) perform stakeholder analysis on their projects. She knows the business side much better than they do, and always points them in the right direction. Helping some department in the Finance group clarify their operations by mapping out their business processes. Trying to influence her boss Sandra to include some more features in the system that Sandra owns (product owner). She lobbies her boss on behalf of her clients on a regular basis when she thinks the value is there. Writing business requirements for a project. Detailing out use cases and mocking up screens for another project. Meet Dorian. A passionate developer early in his career, he’d swore that he’d found his calling in life. Coding. That was well before he found out what the BSA role was all about. When his boss told him about the BSA job posting coming up in his company, he realized it was an opportunity for him to broaden his skills, and his network inside the company, all-the-while still keeping one foot firmly in the technical world. He couldn’t resist. He jumped at the opportunity and has been happily working as a BSA for the last 6 years. Querying the database using SQL to troubleshoot a major bug that’s been a pain point for the business for a while. Writing detailed specifications for the data mapping and the ETL process so that the developers can build the system interfaces and reports the business has been asking for. Helping Min-Yee think through the data structure of a project that she’s been struggling with. She’s not so good with entity modeling just yet, but she’s decided it’s something she wants to start learning because she sees the value in entity modeling for her projects. Meet Amit. He always gets into door #1 of subway car #3 in the morning on his way to work. Is this just some quirky habit of his? Amit knows full well that the first door of the 3rd car stops right in front of the subway station exit doors, saving him at least 45 seconds every day. He’s analyzed it. He’s also found that he can take the freight elevator up to his desk instead of the elevator everyone else uses during the morning rush. He’s always looking for a better way of doing things. You could say that he was born with analysis is in his blood. And his manager Peter is glad it was. Peter knows who to send over when the business is feeling anxious about a very challenging problem that they just can’t figure out. Amit’s good at easing their concerns, finding the root of the problem, formulating a solution & getting buy in for the proposed solution (often a technical solution, but sometimes a plain old workaround). And once he gets the nod of approval for the customers, he elaborates on his proposal down to the level of detail that Marty (development lead) and the team need to build out the technical solution. Trying to convince Mindy (Head of Applications) why the company should be investing in SharePoint instead of just creating more shared network drives. Trying to get a slice of Dorian’s time so Dorian can help him figure out how to write his SQL statement properly. Meeting with Johnson (the CIO) and Isabel (the CFO) to kick off a new business case proposal for a problem that Isabel’s deciding to fix in her group. Which One Of These Is The Right Fit For You? In the next article I’m going to re-introduce you to the solution stack, but this time, I’ll be talking about the skills you will need at each level of the stack. Each of these 3 BA Archetypes works at a different level of the stack, so spend some time understanding these Archetypes and choose the best fit for your BA career. This is the first step to get some clarity for your career. Step #2 coming up in the next article. Interesting article. I like the approach, very clean and practical. That’s usually the Well Rounded BA Archetype who’s already made it up (or is on his way) to the Business Architect position in the company. Nice article, well defined the differences of BA roles. Good article. At different times, each role describes my role. I find that I grow and learn each time I step in another direction. This leads to a very satisfying career. Hi Barb, I wonder how common it is for other analysts to go through all three of these roles? I first started off as a systems analysts/BSA, then swung in the total opposite direction when I started doing pure process improvement work. Over time I’ve settled somewhere in the middle. Nice article. Subtly brings out the difference in each role with a simple and easy to follow example. I loved this article! Excellent! Can’t wait for the next!!! I’m glad you loved it Leke. Next article will be out in a few days. Very insightful article. Gives a clearer view of the different roles. I look forward to the next article. Nice article! I can realte directly to these roles. Been there done that!!! Good one for someone stepping thier foot in BA world. Hi Janice, you’re instinct is probably right. If you’re coming into Business Analysis from the QA world, then chances are that you spend most of your time with software and are probably more technically inclined.